June 02, 2014: The Indian government has proposed that Russia continue to extend support to maintain the INS Vikramaditya even after the one-year warranty period expires on November 16 this year. A Russian delegation headed by Sevmash General Director Mikhail Budnichenko was in Mumbai and Karwar last month to take discussions forward and to inspect progress made by the Russian warranty team embedded with the 44,500-ton aircraft carrier now on operational deployment in the Indian Ocean. The Russian team discussed the modalities of a warranty extension and the possibility of the Russian team staying longer at Karwar to ensure a smoother transition into full operational status. The Indian Navy has begun the process to identify and confirm armaments for the Vikramaditya, which sailed from Severodvinsk to India without any air defence weapons. Director General of Naval Projects (Mumbai) Vice Admiral Ashok Subhedar presented the visting Sevmash delegation with a list of work that had been completed by the Russian team, including completely re-laying the aircraft deck and other jobs by the paint-insultation and and assembly teams. 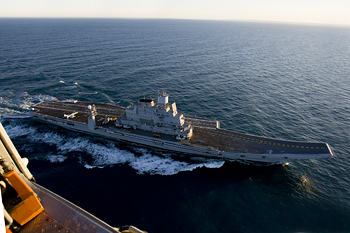 Navy chief Admiral RK Dhowan recently revealed that the INS Vikramaditya was successfully on operational deployment. It has separately been confirmed that the navy's MiG-29Ks have begun operating on the ship deck successfully too with a first landing by an Indian pilot taking place on Feb 7.